Discharge from a residential addiction treatment program is just the first step in the lifelong journey towards recovery. Rehabilitation is a process; from the initial phone call, to completing psychological assessments and undergoing evaluations, to withdrawal and detox, and then spending a considerable amount of time in residential inpatient treatment, the beginning of recovery is quite a journey in and of itself. Many recovering addicts feel they’ve completed the process at this point. However, the professional staff at His House, some of whom are recovering addicts themselves, and all of whom are experienced in the recovery and rehab industry, will tell you with certainty this is not the case. Continuing care, or aftercare, series of programs to smooth the transition from inpatient rehabilitation to back to regular life. In the life of a recovering addict, triggers for relapse are everywhere. It can be very difficult to avoid using; for example, it’s tough on a recovering alcoholic when entering social situations such as a dinner party or football game where they used to drink; additionally, in many cases, the recovering individual’s social circle revolved around the use of a particular drug or drugs. His and Her House Continuing Care programs are there to help our alumni avoid these temptation, learn to adapt in social situations where triggers are present, and to build and rebuild healthy relationships with friends and family. Alumni Programs – His and Her House offers an extensive Alumni program. We’ve found that people in recovery tend to feel more comfortable around people who’ve navigated the same dangerous road to sobriety as they have. To this end we organize events such as BBQ, live concerts, meet-and-greets, and outdoor day trips (for example, to the beach). Alumni programs create a safe space for men and women in recovery to forge new friendships, further their journey of self-discovery, and to help their fellow recovering addicts do the same. Meetings and Chapters – We strongly encourage our Alumni to engage in meetings with 12 step programs such as Alcoholic Anonymous and Narcotics Anonymous. In fact, many of our own programs are based on the tenets of the 12 step program. 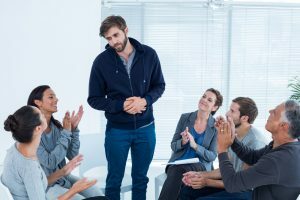 These meetings are proven over decades to help addicts maintain their sobriety in the long term and to help rebound from relapses when and if they occur. Sober Living Programs – Sober Living (sometimes known as halfway houses) is a treatment program for those who have finished residential inpatient treatment but still need a strictly controlled living environment. Sober Living patients live at one of our cozy and welcoming houses with fellow recovering addicts and house managers while spending their days at work or school. These programs allow the patient to engage again with their lives and routines while maintaining the discipline and structure they need. Sober Living programs are proven to help patients maintain sobriety and learn important skills to improve on harmful behaviors. Sober living can be considered similar to “living at a meeting.” Residents at our Palm Houses have a built-in support system of their peers in the place where they live. Most recovering addicts find this to be the most beneficial aspect of Sober Living for their recovery. His and Her House Sober Living programs offer a place where recovering addicts can be assured of a drug-free, productive environment where they can continue their own personal growth and recovery. We offer gender-specific houses, for men only and for women only, which allow for the removal of even more distractions for our patients. Sober living provides those in recovery a continuation of the discipline which helped them during residential treatment. Most houses require patients to agree to strict rules before admitting. These can include restrictions on materials (such as mouthwash or hand sanitizers) which would cause relapses, curfews, submission to unannounced drug tests, enforced bedtimes and meal times, chores, and others. Violations can lead to negative marks and even expulsion from the house. Whether it’s Sober Living, joining the Alumni program, or even committing to attending NA or AA meetings, continuing care programs are essential for the long-term recovery and sobriety of any recovering addict or alcoholic; no inpatient or outpatient treatment program will permanently eliminate all cravings or triggers to relapse. Your path to sobriety is smoothest when you take steps to ensure continuing care in your life. Please call our treatment specialists today if you or a loved one is struggling with drug or alcohol addiction. We can help you personalize your treatment plan and get your life back on track.